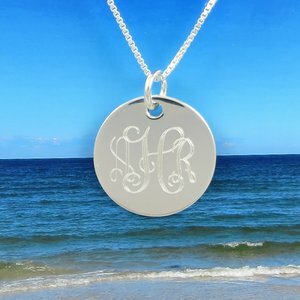 This personalized monogram silver necklace is hand cut and polished out of 18 gauge Sterling silver. (the lower the gauge, the thicker the piece, example: 18 g is double 24 g) and measures 7/8" in diameter. An interlocking script monogram is the perfect way to personalize any special occasion. The quality is supurb and makes an excellent bridesmaids gift that will match any outfit. Monogrammed Necklace comes complete with your choice of a 16', 18" or 20" sterling silver box chain and a high end gift box your Bridesmaids will love.